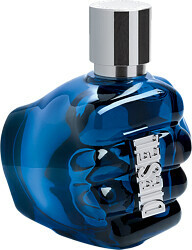 Push back the limits with Diesel Only The Brave Extreme Eau de Toilette, an oriental woody fragrance for men. The exhilarating Eau de Toilette is a scent that will evoke courage and bravery, its fresh aroma willing every man to conquer his fears. Stronger, deeper and more sensual than its predecessor, Only The Brave Extreme is a fragrance unlike any other. Destined for a man seeking thrill and adventure, Only The Brave Extreme is the only option for 21st century heroes. The Only The Brave Extreme scent waits for no-one, bursting open with fresh top notes of lemon primofiore, mandarin and spicy coriander. The composition takes a new direction in the heart as a zesty apple accord unravels with a bold blend of rose and violet leaves. A final dose of power is delivered in the base as warm, woody nuances of patchouli meet with addictive notes of tonka bean and a leather accord, for an undeniably masculine signature .